Studio: The studio style is our most popular model thanks to its remarkable versatility. It can be used with both single- and two-story homes, as well as with one-, two-, three-, and return-wall configurations. Cathedral: The cathedral style, which is available in three configurations — low cathedral, factory cathedral, and custom cathedral — is characterized by its stunning vaulted ceilings, which will lend a sense of elegance and grandeur to the exterior of your Toms River, NJ, home. California: The modern-looking California style features a split-level design that allows for increased sunlight reception. Its taller back wall makes it perfect for homes with more than one story. 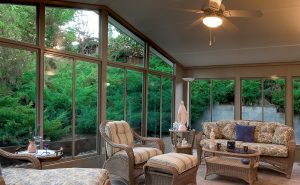 Solarium: The solarium style is available in both two- and three-wall configurations and includes an all-glass thermal roof that gently slopes away from the exterior of your home, allowing for maximum light reception. Conservatory: The conservatory style features a shatterproof polycarbonate roof. This model is available in both square Edwardian and faceted Victorian frameworks, and comes with operable roof vents and a ridge ventilation system. All of these models are built using heavy-duty, fully extruded aluminum, making our outdoor rooms stronger than their wood, vinyl, and roll-formed aluminum counterparts. Plus, our outdoor rooms are coated with TEMO’s exclusive TEMKOR polymer surfacing, keeping them protected from fading, chalking, scratching, cracking, peeling, warping, and denting. If you would like to learn more about the various styles of outdoor rooms available to Toms River, NJ, homeowners, please contact SRA Home Products today.